I received this plant as a wedding take away and can't figure out what it is. 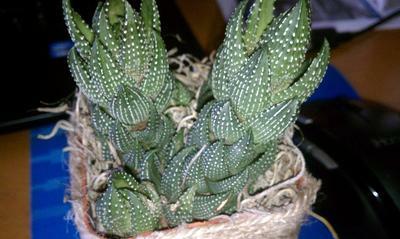 Hi Lori, what a great little plant - this is some type of Haworthia, which are related to Aloe and other similar succulents. The big difference with Haworthia is that they really don't appreciate the heat and bright conditions that Aloe love, so keep it in a slightly shaded place, like a bright curtain filtered window, and give a little more water than you would some of the other desert succulents. See more about these lovely little succulents here: Haworthia and see this page on succulent care to find out how to look after it.